What is VASERlipo® Liposuction ? VASERlipo® is a revolutionary liposuction procedure that can be used for minor touch ups to major transformations. VASERlipo® can be used to treat large areas of unwanted fat or smaller very specific areas to finely sculpt, adding definition. It can help with those stubborn areas, such as love handles, that will not shift through diet and rigorous exercise alone and can improve your overall shape by adjusting your proportions. In 2004, Dr. Sean Daneshmand opened Ageless and Beautiful Medical Spa. 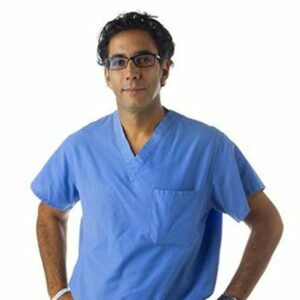 Dr. Daneshmand has extensive experience performing the Vaser Lipo treatment for the men and women of San Diego County. Dr. Daneshmand has a true artful eye that helps our clients achieve their goals of body sculpting, symmetry, and all over aesthetic beauty. Ageless & Beautiful offers free consultations for liposuction so you can be educated on the procedure before making a decision. To see if you are a candidate for the Vaser Liposelection™ treatment, fill out the form to the right or call us today. VASERlipo® is rapidly replacing the traditional liposuction technique thanks to a host of patient advantages. While traditional liposuction procedures involve the removal of unwanted fat using suction, this process is not very tissue selective and will remove not only unwanted fat but also cause damage to blood vessels, nerve tissue and connective tissue. Due to the high suction levels required, the trauma to the patient is always much higher which leads to larger areas of bruising and longer down time. VASER® LipoSelection uses ultrasonic technology which is tissue selective; the ultrasound energy is used to target unwanted fat whilst preserving important tissues such as nerves, blood vessels and collagen. As a result, the patient should suffer less trauma and therefore less bruising and a much quicker recovery time. If you’re still not sure which level of VASERlipo® is right for you, don’t worry, this will be discussed at length during your consultation taking into consideration the starting point of where your body is now and the desired outcome. If you are among the potential millions of individuals seeking a low-pain path to a slimmer, more youthful body, VASER® LipoSelection could be the solution for you. How does the The VaserLipo® System Work? The VaserLipo System uses ultrasound energy to break up and emulsify fat, leaving surrounding tissue – such as nerves, blood vessels and connective tissue – relatively intact. After a local anesthetic is applied, the surgeon will fill the area to be treated with a saline wetting solution to numb the site and shrink blood vessels. This helps minimize post-surgical bruising and swelling. A small probe emitting high frequency sound energy is used to break up fat on contact with minimal damage to surrounding tissues. Fat may then be easily extracted with liposuction tubes. The VASER LipoSelection® procedure uses the VASER System’s patented innovative ultrasound technology for fatty tissue emulsion and proprietary cannulae designed to minimize tissue trauma during aspiration. Because nerves and blood vessels are largely undisturbed, patients and physicians report low to minimal pain and bruising. Moreover, the VASER LipoSelection® procedure allows physicians to work with such precision that they can shape delicate areas like the inner thighs, arms, chin and neck. Read more about VASER® LipoSelection by Solta Medical. *Confirm Information with Other Sources and Your Doctor: You are encouraged to confer with your doctor with regard to information contained on or through this Web site. After reading articles or other Content from this Web site, you are encouraged to review the information carefully with your professional healthcare provider.